Make 3D content yourself! The program is extremely simple in its usage. In order to create a 3D image, you need to take two shots of a still set object captured with a small horizontal shift. Usually the distance must be about 2-3 inches to have the right scene. Both shots are inserted into the program and next second a 3D image is created in the location which you define on your PC. Please note that in order to watch the output 3D picture it is necessary to use stereo anaglyph glasses. 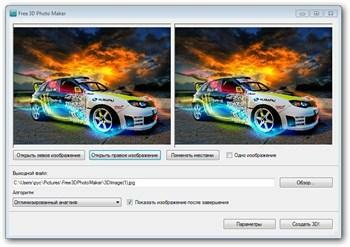 Free 3D Photo Maker contains no spyware or adware. It's clearly free and absolutely safe to install and run. Calling all cars, clailng all cars, we're ready to make a deal.